DES MOINES — Five forced turnovers and a dominant offensive performance propelled the Iowa Barnstormers (6-0) over the Bismarck Bucks (0-6) 55-16 at the Bismarck Event Center on Sunday. The Bismarck offense started with the football to open the game. Defensive back Tyrell Pearson intercepted a deep pass to give the ball back to the Iowa offense right away. Quarterback Daquan Neal found receiver Ryan Balentine on the first offensive possession for the Barnstormers, 7-0. Neal passed for another touchdown on the next offensive possession — this time to receiver Raheem Harvey. New kicker Dalton Hall made the PAT and put Iowa up 14-0. Barnstormers defensive back Tevin Madison forced a fumble and defensive back Jourdan Wickliffe recovered to give the offense the ball back. Neal found Harvey again for a touchdown before the first quarter came to a close, 20-0. The pace slowed down in the second quarter, and both teams were stopped on offense to start. The Barnstormers earned the first touchdown of the second quarter when Neal ran through defenders and scored with his legs, 27-0. On the next defensive possession, Iowa defensive back Jonah McCutcheon intercepted quarterback Homer Causey. Neal found Balentine again to extend Iowa’s lead to 34-0. Bismarck finally got on the board when kicker Blake Levin hit a 33 yard field goal to close out the first half, 34-3. The Barnstormers picked up in the third quarter where they left off, scoring on their first possession. Running back Malik Brown scored on a 23 yard touchdown run, 41-3. The Barnstormers defense forced their fourth turnover, giving the ball back to the offense. Neal made his first mistake of the night when he threw an interception on fourth down to defensive back Antwan Smith. The defense would hold strong. Again, Iowa’s offense misfired. A mishandled snap led to Smith picking the ball up and running into the end zone for the first touchdown of the night for the Bucks, 41-10. In the fourth quarter, Neal passed to Balentine to extend Iowa’s lead to 48-10. Bismarck attempted a fake field goal, but Pearson read it and intercepted the pass for his second interception of the night. The Barnstormers offense ran a halfback pass and Brown hit Balentine to again extend their lead, 55-10. The Bucks would score once more to make the score 55-16 before the game came to a close. 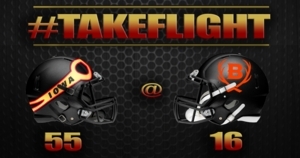 The Barnstormers face a tough test in their next game against the Sioux Falls Storm (5-1) this Saturday, April 20. Kickoff is set for 7:05 p.m. CST at the Denny Sanford Premier Center.